We do not celebrate the entire Martin Luther King. There will be many video clips on television today of his I Have a Dream Speech or him walking arm-in-arm with other protestors to illustrate his nonviolent values. People will write paragraphs about his bravery in the face of extreme hatred, kids in school tomorrow will be asked what Martin Luther King means to them and we will all congratulate ourselves on how far we have come in race relations since King’s time. Thank goodness we live in an enlightened era where whites and blacks can meet as equals. We even have a black President now, who will surely say a few celebratory words today for MLK and what he stood for. This has become the function of Martin Luther King Day. It has served as our annual exercise in self-delusion. The first delusion is our view of Martin Luther King. I have written before about the lousy treatment he gets in the history textbooks. The fact is that we really only celebrate pre-1965 King. We remember the man who led the Montgomery Bus Boycott, wrote a letter from a Birmingham jail, gave the I Have a Dream Speech and stood behind President Johnson as he signed the Civil Rights Act into law. The other MLK, the one who criticized the war in Vietnam and marched against poverty, scarcely receives a mention. His struggles in the name of oppressed people all over the world remain more or less invisible. We want to crown Martin Luther King as the head of an entire race. In reality, he was the leader of a class. The sanitizing of King’s legacy serves a purpose. It makes it seem as if the only oppression that exists in the United States is racial. 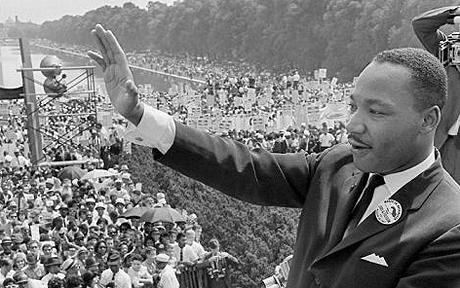 Towards the end of his life, King had fully realized that the struggle for racial equality at home was part of a worldwide struggle against oppression in general. The source of this oppression was economic. Inequality in all of its forms was sustained by an economic system that favors very few and impoverishes the rest. After his fights against southern segregation, he turned to struggles against economic inequality. He supported union activism and started the Poor People’s Campaign. His anti-poverty activities and anti-war stance got him labeled a communist by many of his critics. Our celebration of King’s accomplishments is actually a deception. While personal relations between black and white may have improved over the years, poverty has gotten much worse. Since MLK’s death, millions of Americans who used to be middle class have slid down into the ranks of the poor. At the same time, a select few have risen to the ranks of the super-wealthy. The misdistribution of wealth in the United States would go on to define the post-King era of American history. Celebrating Martin Luther King Day the way we do is part of the American tradition of ignoring that growing poverty. In truth, we have not even come close to fulfilling MLK’s dream. 22% of the black population lives in poverty. The privatization of prisons and the more strict anti-drug laws of the past 35 years have made jail the only end point for that 22%. Education deform has ripped community schools out of minority neighborhoods and replaced them with charter schools. The veteran teachers that used to serve those areas are mostly gone, replaced with the inexperienced half-teacher preferred by charter school operators. Education deform is part of a larger process of re-segregation that has taken place over the past 35 years. And that re-segregation is not being carried out by rabid racists, like the types that blocked the door to the schoolhouse to prevent black children from entering. Instead, re-segregation has taken place with the complicity of both political parties in every part of the country. It has been clothed in the language of free markets and small government. Instead of blocking the door to the schoolhouse, they build a sparkling new schoolhouse that masks the cheap education being offered inside. Instead of bringing back Jim Crow laws, they destroy any part of the federal government that was designed to redress the imbalance between rich and poor. Medicaid, Medicare and welfare have all been destroyed or severely attacked. Minimum wage laws and worker rights have been denuded. Instead of lifting up the least among us, which is what MLK really fought for, we pick on the weakest and blame them for America’s problems. This re-segregation is not purely physical, although spatial separation is a large part of it. Instead, it is a segregation of class. The conservative ascendancy of the past 35 years has been a long-term attempt to ensure everyone stays in their proper classes. Anything that could account for social mobility, like a good education, is being eroded away. In place of free opportunity, we are left with a static arrangement of neo-feudalism where everyone knows their place. The wealthy are entitled to buy politicians and do whatever they want in business and in life. The poor get stricter drug, speech and anti-workers laws designed lock them into a hopeless existence. Martin Luther King Day should not be a day for self-congratulation. Instead, it should be a day of mourning where we reflect on why we are so far from fulfilling his dream of true equality. This entry was posted in An Embattled Career, First Hand: Occupy Wall Street, Parallel Universes, Politics and tagged economics, education, History, Martin Luther King Jr., News, poverty, public education. Bookmark the permalink. I had the privilege of seeing a short play today entitled “Do You Still Dream?” by Kenneth G. Craddox sponsored by the Lakewood Clergy Association. It did cover parts of King’s life I hadn’t known. It and your post were enlightening. King would be very disappointed to find that for so many years we had been letting institutions get away with sanitizing his message of oppression in any form is unacceptable. Absolutely. As a country, we rushed to make a holiday for MLK. I believe that was part of a conspiracy to scrub a complete view of MLK from history. And corporatism is the new white supremacy. Excellent. Excellent. Insightful and honest. Reading new posts from you has become a daily highlight for me.